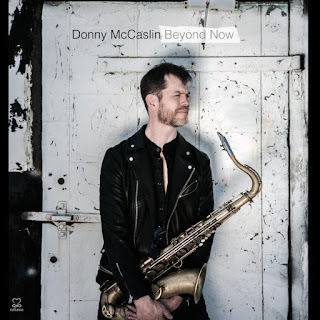 Saxophonist Donny McCaslin and his band, featured on David Bowie's Blackstar, will make their Motéma Music debut with the October 14 release of Beyond Now, a highly anticipated album dedicated to Bowie. Recorded nearly three months after Bowie's passing, the project is deeply influenced by their extraordinary experience collaborating with one of the greatest artists of all-time on his final album. "It was like a dream except it was something I never could have dreamed of," reflects McCaslin on working hand-in-hand with Bowie on Blackstar. "David Bowie was a visionary artist whose generosity, creative spirit, and fearlessness will stay with me the rest of my days. Beyond Now is dedicated to him and to all who loved him." Comprised of core Blackstar personnel, bassist Tim Lefebvre (Tedeschi Trucks Band, Saturday Night Live), drummer Mark Guiliana (Meshell Ndegeocello, Brad Mehldau), and Jason Lindner (Now Vs Now) along with guitarist Nate Wood and producer David Binney, Beyond Now's repertoire is expansive, comprised of two Bowie songs, covers of Deadmau5, MUTEMATH, and the Chainsmokers, as well as compelling McCaslin originals including the title composition, inspired by a track inspired by a song McCaslin recorded for Blackstar that didn't make the album. Today, Entertainment Weekly premiered Beyond Now's first single, "A Small Plot of Land," a cover from Bowie's 1995 release Outside (featuring vocalist Jeff Taylor). The album pre-order has launched today as well on iTunes; fans will receive "A Small Plot of Land" instantly when pre-ordering a download of the album. McCaslin has also announced extensive touring in the US and Europe through the remainder of the year. See below for a list of U.S. tour dates, including upcoming appearances at the Newport Jazz Festival, BRIC Celebrate Brooklyn! and The Charlie Parker Jazz Festival. With three GRAMMY® nominations and 11 albums to his name, McCaslin's path to Bowie and Beyond Now can be traced back to 2011 with the release of his album Perpetual Motion, taking on an electric direction for the first time in contrast to his previous acoustic projects. Two subsequent albums Casting for Gravity (2012) and Fast Future (2015) released with his working band were directly influenced by electronica artists (covering groups such as Aphex Twin, Boards of Canada, and Baths), which netted McCaslin a 2013 GRAMMY® nomination for "Best Improvised Jazz Solo." The once in a lifetime opportunity to work with David Bowie came after composer Maria Schneider, a longtime collaborator, recommended McCaslin and his group to Bowie. Schneider and Bowie were collaborating on the track "Sue (Or in a Season of Crime)," which featured McCaslin as a soloist. In June 2014, Bowie heeded Schneider's advice and made a visit to hear McCaslin and company at the 55 Bar in Greenwich Village. Soon after, Bowie began corresponding with McCaslin over email and sending music, forming a new collaboration and friendship that transpired through the recording of Blackstar until Bowie's passing. The result is Beyond Now, which documents "David Bowie's Last Band" as they were processing both their grief and Bowie's distinctive impact. "This new album is an expression of that journey for all of us," says McCaslin. "David allowed Blackstar to be what it was going to be regardless of how people might have categorized it. More than anything, it was his fearlessness in crossing musical boundaries and genres in his music and life that inspired the approach I'm taking in Beyond Now. I am indebted to Bowie for showing me the risks and rewards of going for your uncompromising musical vision."